Zoologist, Dr Susan Crockford, suspected that the event was actually a well publicised incident in the Autumn of 2017, at Ryrkaypiy in NE Russia, when a group of polar bears drove several hundred walruses over the cliffs to their deaths, before feasting on the corpses. 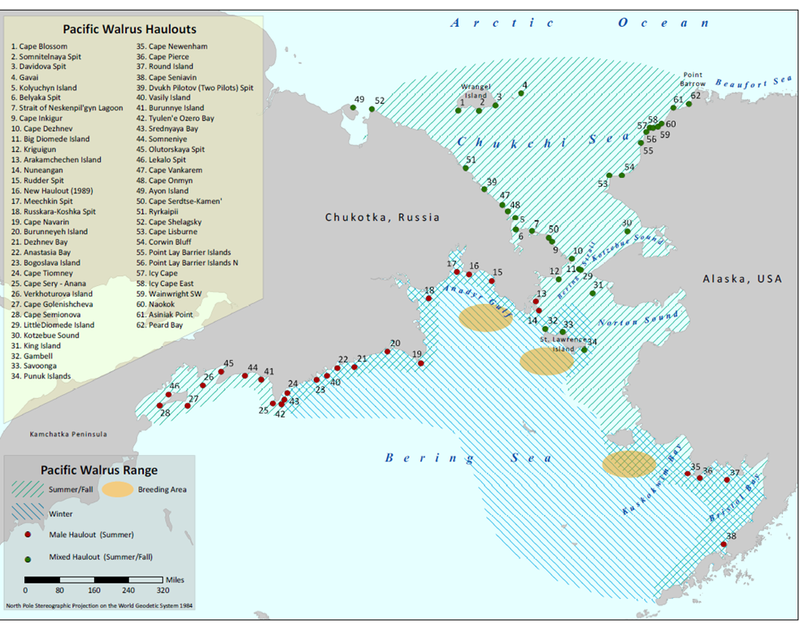 Whereas the males head south, the females and juveniles follow the sea ice north, as it recedes in Spring, eventually going as far as Wrangel Island and Point Barrow. Crucially, as the ice begins to grow back in October, these large herds move ahead of it back south, often coming ashore at places like Ryrkaypiy on the Russian coast (No. 51 on the map above). As the map indicates, such hauling out is commonplace and widespread along that stretch of coastline. (Green dots). An acid test could be whether the upcoming BBC propaganda-fest refers to the issue. I posted more similar comments on the other thread, no point re-posting here. That comment was not meant to be a reply and was aimed at the host/all! I rather hope they do, it should be a winnable complaint. Thank you. As always, the end justifies the means by the addled environmental lobby. Its Author is Bob Ward….Grantham Institute. His Salary is paid by Jeremy and Hannelore Grantham. Not really independent, his job depends on climate change being real. his job depends on climate change being believed to be real. so you get speakers from HSBC, Shell, Drax, National Grid etc. Is there no escape from the BBC? TV viewers now have haulouts on Netflix, only to be slaughtered in sneak attacks from WWF, and radio listeners flocking to Talksport have recently had to endure BBC levels of wailing about the occasional racist remarks directed at multi-millionaire football players. Thank you for outing him as a liar . How he gets away with what he does is beyond comprehension. Walrus death plunges reported in 1996 for 1994 also. The ice extent was ‘normal’ when the first 2 recorded incidents happened. Sir David Attenborough deserves credit for his life’s work and himself points out that he merely narrates what others prepare these days. The fault lies entirely with the producers. Nobody forces him to ‘merely narrate’ climate propaganda, do they? That really is akin to “only following orders”. He was once a great producer/presenter who was told to toe the party line or leave. Bellamy left. The entire aim of the Attenborough’s performance is to convince by deception and propaganda. None of his claims about a climate crisis are credible. The poor walruses are merely low hanging fruit for his opus of deception. 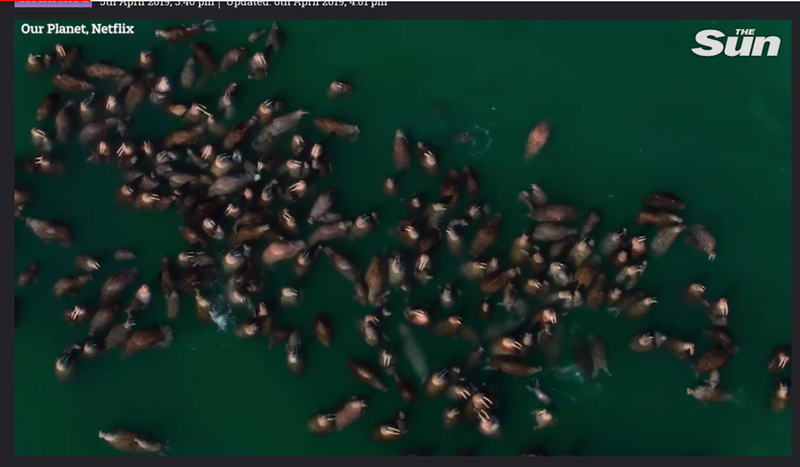 If I had of taken that aerial picture of Walrus, seen in the Attenborough documentary, the US Fish and Wildlife would have seen my flying license taken away. I was filming for French TV and was warned not to fly with 1/2 mile of the Walrus haulout on Round Island. That was 1982! I’m not sure if we’ve seen this before, but a lot of interesting historical perspective on walrus numbers/hunting/deaths/haul outs. Nothing new whatsoever. Sir David has lost his critical thinking abilities. fake news has infected everything. The only good thing is that accelerates de destruction of leftist driven fake media.